How did East Asians come to be referred to as yellow-skinned? It was the result of a series of racial mappings of the world and had nothing to do with the actual colour of people’s skin. In fact, when complexion was mentioned by an early Western traveller or missionary or ambassador (and it very often wasn’t, because skin colour as a racial marker was not fully in place until the 19th century), East Asians were almost always called white, particularly during the period of first modern contact in the 16th century. And on a number of occasions, even more revealingly, the people were termed “as white as we are”. The term yellow occasionally began to appear towards the end of the 18th century and then really took hold of the Western imagination in the 19th. But by the 17th century, the Chinese and Japanese were “darkening” in published texts, gradually losing their erstwhile whiteness when it became clear they would remain unwilling to participate in European systems of trade, religion, and international relations. Calling them white, in other words, was not based on simple perception either and had less to do with pigmentation than their presumed levels of civilisation, culture, literacy, and obedience (particularly if they should become Christianised). Swedish botanist and physician Carl Linnaeus decided that varieties of homo sapiens could be similarly separated into four continental types, one of which was called homo asiaticus. The colour of that group, he said, was fuscus, which can be best translated as “dark”. This was in 1735. 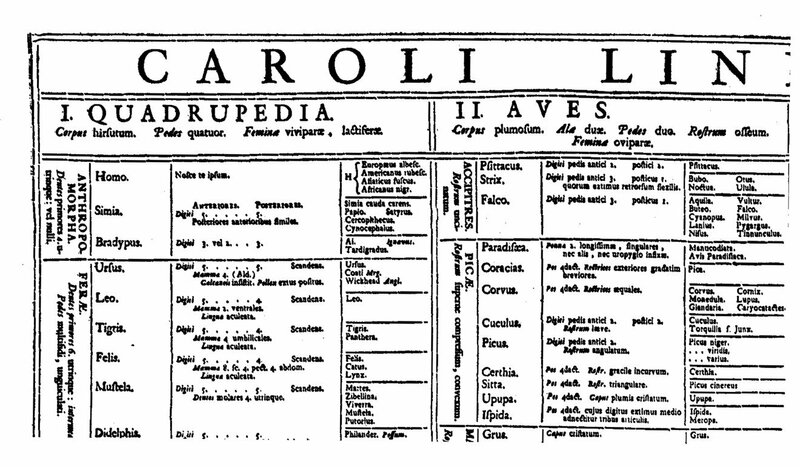 Linnaeus’ racial classifications from 1735. On the left, homo sapiens is divided into four kinds, one of which is H Asiaticus and identified as ‘fuscus’, or dark. Evidently there was some difficulty deciding on a precise colour for Asian Man, since the other three types, European, African, and American, could be “unproblematically” identified according to already accepted stereotypes of white, black, and red. In the tenth edition of Linnaeus’ taxonomy, however, published in 1758, fuscus was silently changed to luridus, meaning “lurid”, “sallow”, or “pale yellow”. The reasons for this alteration were never explained, although luridus also appeared in several of Linnaeus’ botanical publications to characterise unhealthy and toxic plants. Was Asian Man also to be viewed as sickly or dangerous? Later theorists complained about Linnaeus’ overly rigid continental labelling but accepted the notion that mankind could be divided into groups, and that each group should embody a different colour. 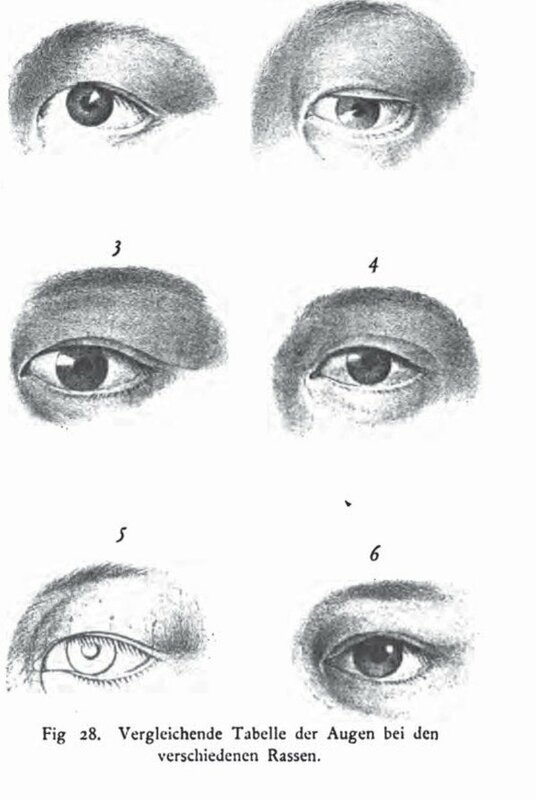 In 1795, the German anatomist Johann Friedrich Blumenbach offered a five-race scheme that featured what might be called our first unequivocal labelling of Asian yellowness, couched in a bizarre series of comparisons that stressed the relative decay or lifelessness of the so-called intermediate races. This human variety, he wrote, was “yellow [gilvus] or the colour of boxwood, halfway between grains of wheat and cooked quinces, or the colour of sucked out and dried lemon peel: familiar to the Mongolian peoples”. The most significant aspect of Blumenbach’s conception was that for the first time all the peoples of the East had been lumped together into an explicitly racial category, here called the Mongolian, which was to become just as menacing and fateful as its much more notorious sister term, Caucasian, which was introduced at exactly the same moment. 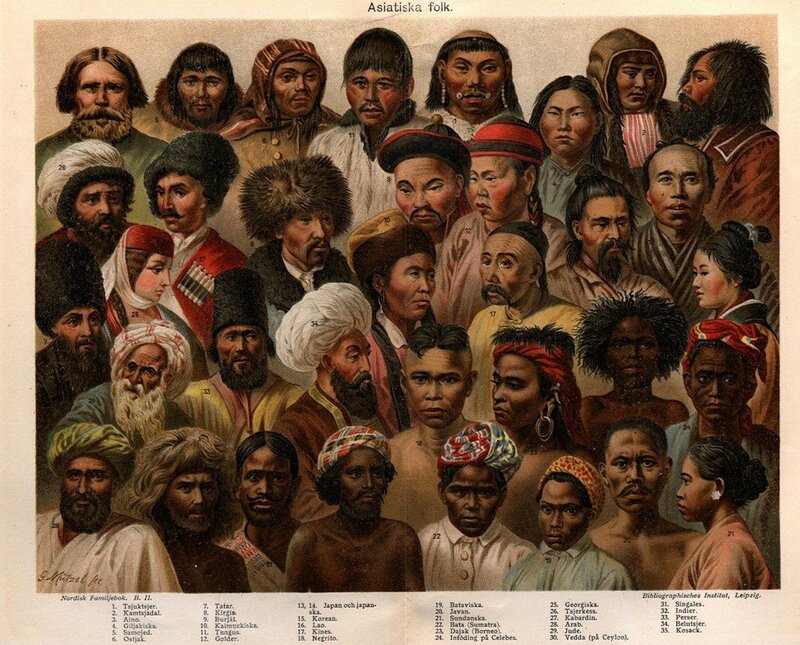 It is crucial to understand that it was not simply that Asians had been coloured yellow in 1795; Mongolians had. “Yellow” was thus a racial marker that had meaning only in relation to the other colours, all of which were defined as against white “normality”. In Blumenbach’s case, Europeans were in the centre of a racial tableau flanked by “Mongolians” and “Ethiopians” with “Americans” and “Malays” in between (Malay was a new, fifth race, comprising the inhabitants of the South Pacific and Australia, only recently discovered). The yellow race became invested with associations that insured that its physical and cultural features were different (or, rather, deviant) from the white European norm. And for other thinkers far more racially virulent than Blumenbach, the races became part of an explicit hierarchy with European white at the top and African black at the bottom, with the “intermediate” races somewhere in the middle. The problem was exactly where in the middle they were, and how to measure that supposed distance. 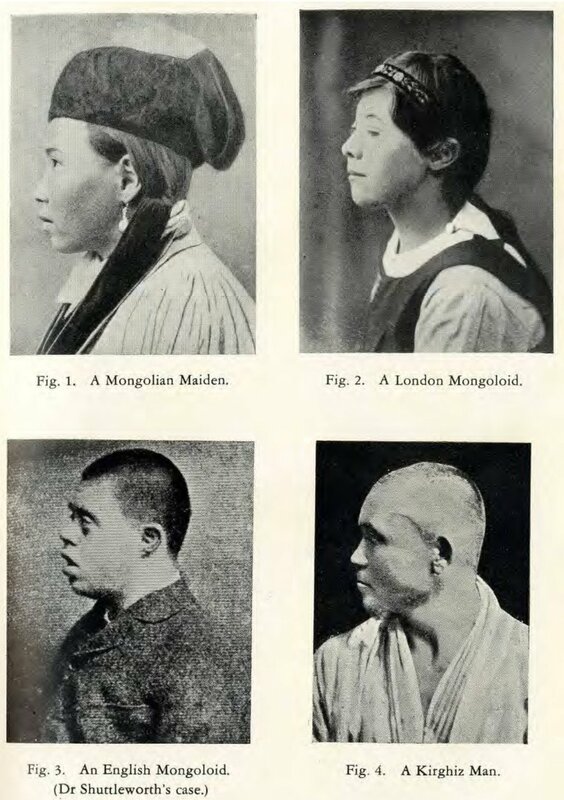 Nineteenth-century medical discourse did much to define the contours of the yellow race, although the emphasis here was on “Mongolianness” rather than colour. Medical research frequently attempted to define the race as embodying certain physical conditions that distinguished them from Caucasians, including the “Mongolian eyefold” (a fold of skin covering the canthus or inner corner of the eye), “Mongolian spots” (congenital bluish marks appearing in infants on their lower back or buttocks), and “Mongolism”, today known as Down syndrome. Each of these conditions was at first supposed to be endemic to the Mongolian race only (and hence their names), and much as in the anthropological obsession with human measurement, these conditions purported to show how the yellow race differed from the healthy and fully developed normality of white European bodies. It was at the end of the 19th century that the notion of yellow became canonised in every European language (and East Asian ones). This was the invention of the so-called Yellow Peril in 1895, brought into worldwide circulation by an illustration made after a drawing by Kaiser Wilhelm II of Germany and designed as a call to arms for European nations to protect themselves from the potential onslaught of East Asian military aggression, social degradation, and emigration to the West. 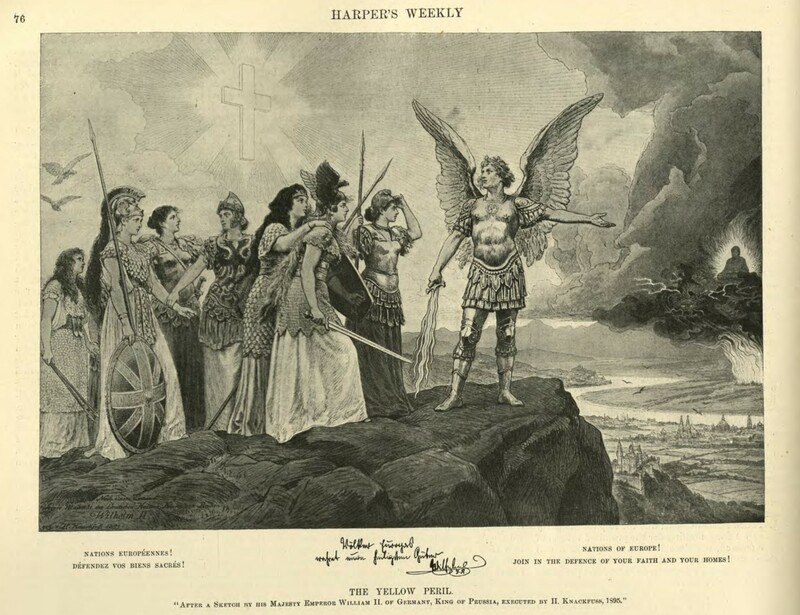 The most immediate danger at this time, it was perceived, came from Japan, which had recently defeated both Russia and China in armed conflict and had begun to build an empire of its own. It was also at this time that ideas about a yellow race began to be imported into East Asian cultures themselves, along with many other facets of modern Western science and technology. As might be expected there were a wide variety of responses, rejections, and incorporations, not only to the idea that there were yellow people but also to the contention that all East Asians could be lumped together into a single racial category. In China, for example, the yellow race was often seen as an appealing notion since yellow was such a significant colour in Chinese culture (such as the yellow river and the Yellow Emperor). Perhaps the Chinese were gold-coloured people, far superior to white Westerners, who were merely silver. In Japan, however, yellow carried no such positive associations and the colour category was frequently rejected. “The Chinese were yellow,” it was sometimes said, “not we Japanese, who are far superior to the Chinese and on a par with the Western imperial powers.” Many in the West agreed, even though the Japanese could not escape the stigma of being, after all, “coloured” people, maybe not as yellow as the Chinese but certainly not white. These stories of reception in the Far East require more research, but for now, it is clear the invention of yellow in Western racial thinking cannot be traced to a Chinese source. Yellow was a fantasy like all other racial groupings. It cannot be traced back before the end of the 18th century, and it had no basis in anything other than an attempt to distance certain peoples of the world from an equally fantasised concept of whiteness.